Martin Walls passed peacefully away at his home on the 9th of July 2008. I thoroughly enjoyed your recollections of your introduction to Tri-ang. The photos of your layout are worth their weight in gold. It is a very similar story for many of us , almost to the point where one could construct a template and we would just insert the year, whether it was a birthday or Christmas gift and the contents of that first beloved train set. A couple of years later , I was given a set with an 0-6-0 diesel shunter, NATO-green missile launcher, searchlight wagon and the red exploding wagon . Those Tri-ang designers certainly knew how to appeal to a boy's love for gadgets and weapons! 1971 was my next train set which comprised an 0-6-0 diesel (again, but blue this time ) and 2 Freightliner wagons and that new modern System 6 track. Again I loved it, still no passenger carriages, but I liked wagons or containers that had opening doors or could carry things. In the early 70s I was old enough to venture alone to the major retail area of Newcastle, NSW. I went straight to any establishment that stocked Tri-ang. In those days major department stores such as Waltons, The Co-op Store and David Jones would generally only stock the train sets. Extra track and rolling stock was the domain of toy and hobby shops such as Vic Barnes at New Lambton, a toy shop in Hunter St, Newcastle West and Ell's Books (and toys) in the eastern end of Newcastle. I was such a regular customer at Ell's ( later Angus and Robertson) that, in the late 70s, I was offered a casual position in the toy department. At that time Tyco offered a cheaper option to electric model railways, but I could honestly inform customers that Hornby ( Tri-ang ) was a superior product although more expensive. As a boy of 11 or 12 , the sight of the red and yellow boxes stacked on shelves behind the shop counter was a joy to behind. If I recall correctly, my first purchase ( as opposed to gifts ) was a Super 4 right hand point. The engineering of a device to change a train from one track to another was fascinating and I spent a long time examining the point before actually including it in the oval of track that occupied the loungeroom floor. Later, when I could afford a remote control set for that point it was a wonder I didn't wear out that lever frame switch and solenoid. Other acquisitions were usually based on what I could afford more than want I really wanted. However the hydraulic buffer stop or the track cleaning car were still appreciated - in fact anything that came in the alluring red and yellow boxes was always eagerly opened during the ride home on a Government double decker. The presentation and packaging of Tri-ang has always been a strength of the company and it certainly worked on me. In fact, a set of points or a wagon would lose a little something when I removed it from the box, but it was very difficult to make use of them otherwise! Another strong attraction for me was the mythical place called Margate that the catalogues spoke of. This factory was huge and produced absolutely everything under the one roof . The continuity, and thus a link to my childhood, is also appreciated by me. Items such as the lever frame switches still carry the same catalogue numbers ( the familiar "R" number ) and are entering their sixth decade of production. I became very brand loyal, to the extreme that I would not tolerate any non-Hornby (Tri-ang) items, be they stations, signals, buildings, bridges etc. As an adult I have relented on that restriction - to a degree. To a child the gift of an electric train also meant that he or she had control of a mains powered transformer - something that a gadget loving kid relishes. The design and appearance of the control units was as important to me as the locomotives and wagons. I am sure that it was my first electric train set that fostered my interest in electronics later. To this day, the sight of the red, green and black wiring connected to a points solenoid looks cool. Tri-ang were excellent in encouraging and supporting locomotive maintenance by their young owners. The well drawn instruction sheets were wonderful pieces of art . The vast array of spare parts available was great. It made a boy or girl feel very adept at mechanical and electrical engineering as he or she tended to their electrically powered, gear driven motors. Catalogues and literature, particularly from my favoured Tri-ang Hornby era ( mid 60s to early 70s) are a great source of enjoyment and nostalgia for me. I prefer the catalogues in landscape format, featuring large photos of a dream layout that I would carefully examine for hours. It was not until I was a lot older that it dawned on me that the layouts were totally impractical in that the running lines went from nowhere to nowhere, bridges and viaducts in strange locations, no road or pedestrian access to stations and so on - the "layout" was just a device to incorporate the maximum amount of Tri-ang products in a single shot. Of course for pure visual appeal this was fine, but to emulate such a layout was not an option. Of course interest waned, as is common. Another brief foray in my late teenage years saw my first permanent layout on an 8' x 4' sheet of Pineboard(tm) . It was based on the cover photo of the 3rd and 4th edition of the Hornby Railways Track Plans (first printed 1975). Plan 9 titled "Double track or extensive single track " was a lot of fun because two trains could run on separate circuits or on one long up-and-over route. With two trains running, they crossed paths at a diamond crossing where a spectacular smash would occur if your concentration lapsed. An interesting track formation had a lot of appeal, the geometry of tracks inter-twining via points and diamond crossings is an important consideration in my layout selection. Then all was quiet until late 2002 and eBay . 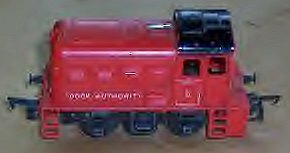 My childhood rolling stock had suffered ( very play-worn ) and some were disposed of by my mother when I wasn't looking, so eBay and Visa were instrumental in building a collection that I dreamed of , but could never hope to acquire in the 60s and 70s. I have gathered a fleet of DS which now exceeds 20, lots of Freightliner flat wagons and containers, open wagons, Bird's Eye vans, some Battlespace vehicles, R342 car transporter wagons plus, at last, some passenger cars including the later version of the NSW and Victorian examples. Also, the famous operating mail coach is finally in my inventory. I paid too much for a Budd railcar and the upper storey of the bright red terminus station, but such is life. Tri-ang and Hornby's attempts at Australian diesels were crude but the R159 double-ended diesel ( grossly out of scale and wrong bogies ) still looks great cruising around my layout.The Hornby version of the XPT is not too bad. The turntable that I waited over 35 years to acquire is not used nearly as much as I thought, with its noisy X.04 motor and slow rate of rotation. I now have bridges and viaducts in locations that don't quite match the geography. The Grand Victorian Suspension Bridge is impressive. Despite having used System 6 and Peco track, I now have a 100% Super 4 layout so my deep flanged and Magnadhesion locos can roam free. The huge rail profile complements the chunky, robust rolling stock. Code 100 or smaller rail looks too flimsy to support Tri-ang locomotives. My layout has the classic configurations of diamond crossings allowing a train to perilously dart across the path of 3 oncoming trains on my main lines. Only in the last few weeks have I ventured into the world of Minic Motorways. I was lured by the eBay sale of a double track level crossing, so I was very interested to see your use of Minic. I am still yet to purchase any cars - they certainly are expensive. Thanks John for your invitation to recall my world of Tri-ang.